MOSCOW, August 15. /TASS/. Ukrainian security service SBU agent Gennady Limeshko, detained by Russia’s security service FSB for plotting acts of sabotage in Crimea, has testified he underwent training as a member of a group of saboteurs tasked to stage acts of sabotage in Crimea and other Russian regions and also in the Donetsk Republic, as follows from a video made public by the FSB. In the video obtained by TASS Lemeshko says the course included physical training, shooting practice, special tactical instruction and the handling and use of explosives. "What were your tasks?" an FSB investigator asks Limeshko in the video. "Reconnaissance and sabotage in the Donesk People’s Republic, Crimea and other areas of Russia," the detainee says in reply. Limeshko has admitted to have received 5,000 hryvnias ($195) to carry out acts of sabotage in Crimea. 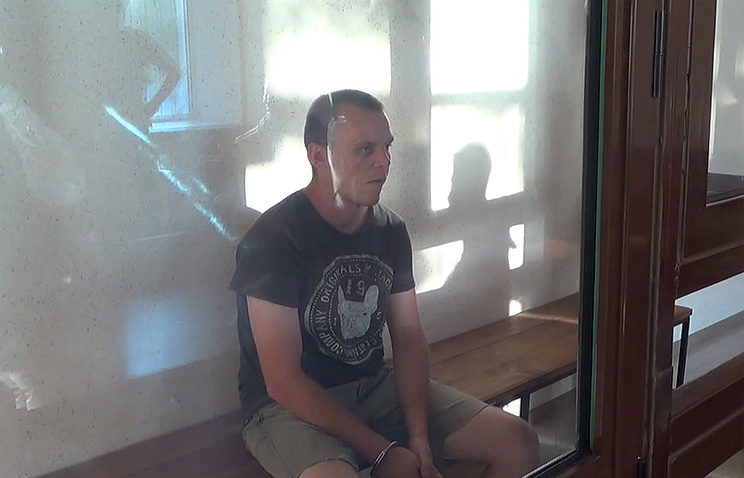 In the video Limeshko says that "upon arriving in Kherson on June 2, we met with a local SBU officer named Andrei, who is also known as Artur Narimanovich." "Andrei proposed that we destroy a powerline between Sudak and Novy Svet, as well as provoke a landslide to damage a highway, set on fire a garbage dump near the Rybachye settlement and also a forest near Alushta," Limishko said adding that he had accepted the proposal. "I agreed and received 5,000 hryvnias to implement the task," he said. As reported earlier, Limeshko, a Ukrainian citizen coming from the Kharkov region, was detained in Crimea for plotting sabotage activities. In the past, he served as a senior scout in a Ukrainian military unit taking part in the so-called anti-terrorist operation in Donbass. 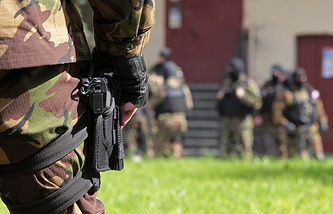 Two TNT blocks were seized from the SBU agent, as well as a trigger mechanism for explosive devices, a hand grenade, containers with flammable mixtures, a handsaw for filing through electricity poles and a digital photo camera to document his activities and present a report to his seniors at the Ukrainian Security Service. On August 9, Limeshko arrived in Crimea to implement the SBU’s orders to damage powerlines between the town of Sudak and the Novy Svet settlement that could lead to a power outage affecting an area with a population of more than 50,000. He had been also tasked to set forests in the Sudak area on fire and create conditions for landslides blocking the highway connecting Sudak and Novy Svet. Limeshko also planned to set on fire a public utility facility in the Rybachye settlement area. The FSB department in Crimea and the city of Sevastopol has launched a criminal case. An investigation is underway to establish Limeshko’s possible accomplices. However, Ukraine’s Security Service has rejected the FSB’s statement about the detention of an SBU agent. According to SBU Spokesperson Yelena GItlyanskaya, the service "does not know who he is."